Memory makers are taking advantage of AMD's comeback. For the past several years, memory makers have been releasing high performance RAM kits aimed at Intel platforms. Now it's AMD's turn. 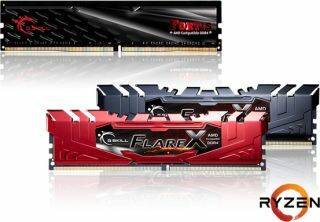 With the release of Ryzen, G.Skill wasted little time in unveiling two new memory lines, Flare X and Fortis, both of which are specifically aimed at Ryzen builds. Pitching a memory kit or module at one platform over another is largely a marketing play. There should not be anything that prevents the Flare X and Fortis kits from working in an Intel setup, there just might be some manual tuning required in the absence of pre-configured profiles. Either way, it's a kind of blast from the past to see memory makers trot out overclocking kits specifically for AMD. It's a testament to Ryzen, which doesn't have the gaming chops we were hoping for (not yet anyway), but does make AMD competitive again (see our full review for in-depth analysis and benchmarks). The higher performing of the two new memory lines is the Flare X. For these modules, G.Skill says it carefully selects ICs that are specifically tested and validated for AM4 platforms. These are available in up to 64GB kits as high as 3200MHz, or up to 32GB in 3466MHz territory. The latter is the fastest G.Skill memory kit for AMD to date. G.Skill's Fortis kits modules are intended to be cost effective solutions for gamers. It's offered in kits running at up to 2,400MHz in capacities ranging from 8GB to 64GB. Unfortunately G.Skill left out pricing information, though it did say that these kits will be available globally next month.